IFCA is returning to one of its favourite slalom hotspots for the 2015 Junior, Youth and Masters Slalom European Championships from 28th April to 3rd May 2015. Notice of race has just been published and on-line entry is now open. 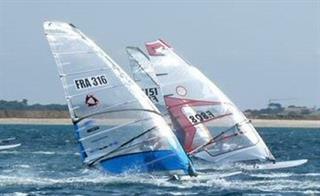 Not only the venue for the 2010 Junior, Youth and Masters Slalom World Championships and the 2011 Junior, Youth and Masters European Championships, Almanarre was also the venue for the IFCA Slalom Worlds 2007 – “the highlight of the IFCA Slalom season”. Located in the South of France, on the Mediterranean coast, close to the city of Hyeres, the white sandy beach at l’Almanarre stretches for nearly 3 miles along the western spit of the Giens tombolo. Visit “Discover Hyeres” or Hyeres Tourism to find out more about the area. Half the Places Taken Already for Defi Wind 2015!